Ninety university students are among more than 1,000 people arrested since anti-government demonstrations began last month, say reformist MPs in Iran. Mahmoud Sadeghi told the Iranian Students' News Agency that many of them were not involved in protests. Another MP, Farid Mousavi, said it was a preventative measure and they would be released soon. At least 21 people have been killed in the protests, which erupted across the country over the state of the economy. The head of Iran's Revolutionary Guards on Wednesday declared the defeat of what he described as "sedition" in the country. Despite this, a number of towns and cities saw fresh protests overnight. However, Reuters, quoting local residents, said they were showing signs of abating after the Revolutionary Guards were sent to several provinces. The unrest - the most widescale of its kind since a disputed presidential election in 2009 - initially began over price rises and corruption but protests have since turned into wider anti-government sentiment. Some reports put the number of people arrested since 28 December as high as 1,700. The vice-president of Tehran University, which has seen clashes in recent days, said a committee had been formed to track the fate of students who had been arrested. "Our efforts at the university are aimed at co-operating with the relevant authorities to create the conditions for the return of the detained students to the university and their families in the shortest possible time," Majid Sarsangi told the Iranian Students' News Agency. MP Mahmoud Sadeghi said little was known about at least 10 of the 90 students detained. He told semi-official Ilna news agency that 58 were from universities in Tehran, and the rest from across the country. Many of them, he said, had been arrested at their homes. "Preventative" arrests of university students are rather uncommon in Iran. Although some of the students were not involved in the protests, the authorities are fearful of their influence. 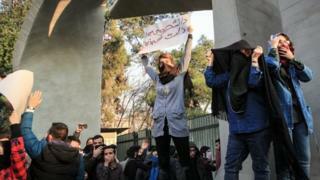 Historically, universities have been hotbeds of political opposition to the Iranian government. The anti-government protests of 1999 were started by university students in response to the closure of a reformist newspaper. According to the authorities, more than 90% of those arrested in the last 10 days are under the age of 25. With a young, tech-savvy population that wants more freedom and a better economy, the Iranian politicians' fear of youth organisations is not surprising. Video seen by the BBC shows people gathered in front of Evin Prison in central Tehran, in an attempt to find out about their loved ones. Meanwhile, state TV has broadcast images of thousands of pro-government supporters attending fresh rallies on Saturday, with some chanting "death to America", "death to Israel" and "death to Britain". It comes a day after Iran accused the US of abusing its power as a permanent member of the UN Security Council after it convened an emergency session over the protests. US officials, including President Donald Trump, have voiced their support for the protests since they began. The US envoy to the UN, Nikki Haley, told the council on Friday that Washington stood "unapologetically with those in Iran who seek freedom for themselves, prosperity for their families and dignity for their nation". The move to hold the emergency meeting angered other council members, including Russia, whose envoy described the protests as an "internal affair". 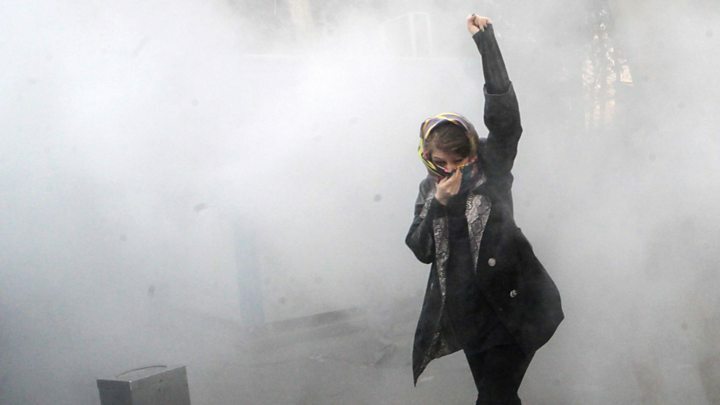 Iranian officials have blamed the demonstrations on foreign meddling and at the UN on Friday Iranian envoy Gholamali Khoshroo said Tehran had "hard evidence" that they were "very clearly directed from abroad".